Someone decided to finally show up! But for now, see you all next week! Have a great holiday. You deserve it. Have a very Merry Christmas and/or holidays. Your skill in depicting personality in a person’s face is so good, Lorena. Noor looks kind and very likeable, while Rogier looks all “yes, I knew it would be him!” and Dylan has a rather sarcastic response to Rogier. I look forward to Noor filling in Suzzen about her parents and what happened in the past. He obviously knows things that whoever is behind the books bring changed doesn’t want found out. I hope our small group hadn’t been followed – but they likely have. 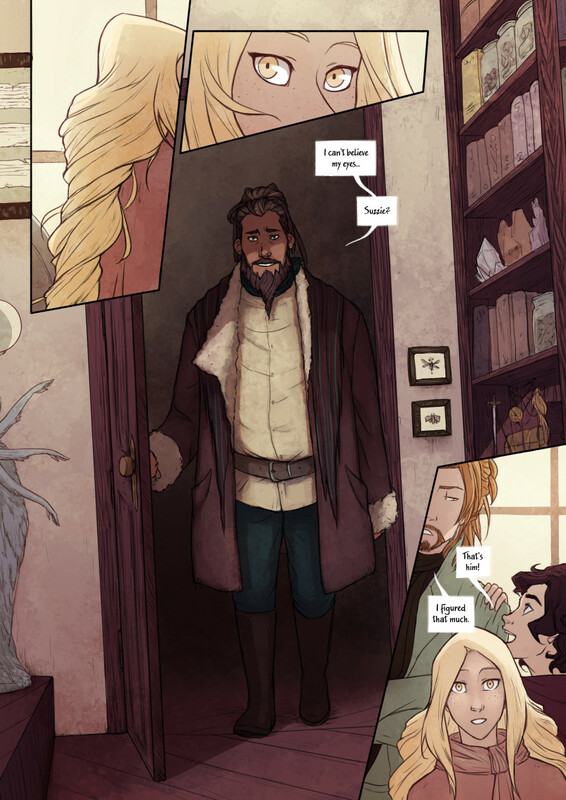 So we get one more new page before you get a much needed break. Enjoy your holidays and rest. You deserve a break like others take! Thank you very much, Jude! I’m glad you feel that way about the character expressions ^^ They are always a challenge, and Noor’s are going to be tough to get right, so thank you for saying that! It’s encouraging 🙂 I hope you also enjoy the holidays and get time to rest! I’ve really started to like his hair up.